It is INCOGNITO’s BLACK FRIDAY WEEK. ** Buy any 3, 6 or 9 week Salsa / Bachata course at our clubs (not online) and get the 2nd one half price. ** Buy the 3 hour Salsa Workshop or 3 hour Ladies Bachata for 8th Dec and get a second workshop for half price for any 3 hour Workshop in 2019. Sale ends at midnight on Friday 23rd. 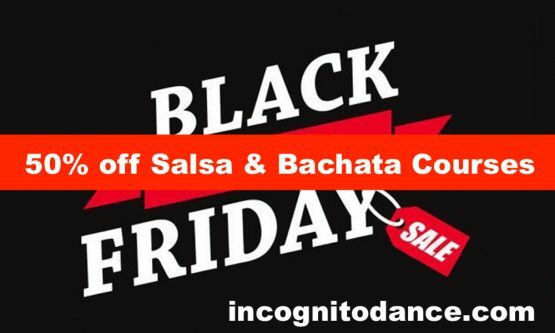 Incognito Dance offer Salsa classes every week in Wimbledon, Putney, Hammersmith & High Wycombe. All classes are taught by highly trained dance instructors in a fun and friendly informal atmosphere. Absolute beginners are warmly welcomed. No partner required, you can come alone or with a group of friends. Prior bookings not essential. We get dozens of new beginners every week in all our clubs. You can simply turn up, sign in and dance. Our classes and clubs have won many awards for being the best places to learn to dance. Our classes are structured to help you learn quickly, get fit, socialise and have great fun all in one night. After the salsa & bachata classes you can practice, dance all night or sit back , relax and enjoy the music with friends. Incognito Dance Company regularly host performance groups show nights, special guest teachers, guest DJ’s, live music and of course, plenty of salsa dancing.